Listen to your favorite music, and stay organized while you work! 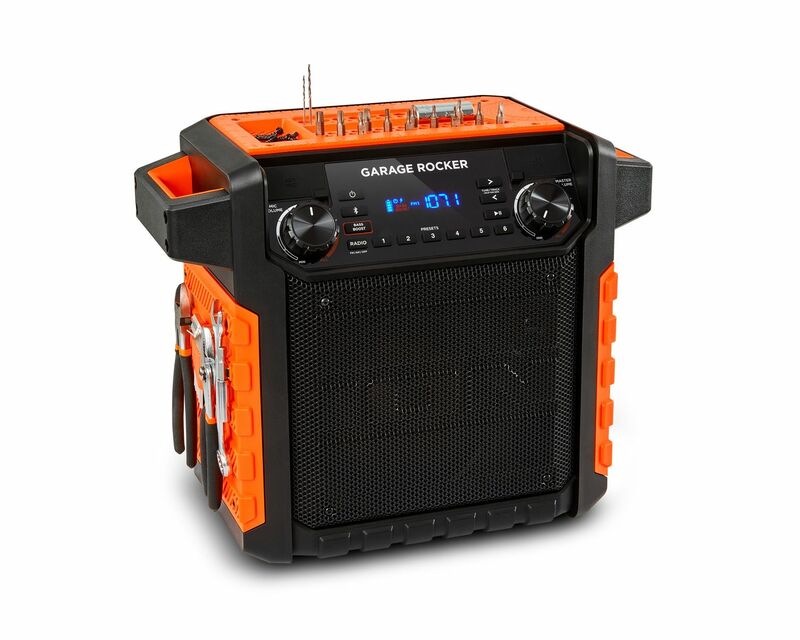 Garage Rocker is the perfect companion for construction sites, home improvement projects, or for when you’re getting your hands dirty in the backyard or workshop. Its powerful 50-watt speaker system delivers vibrant, lifelike sound, so music sounds great. It’s IPX5 waterproof, so you can keep working—you don’t have to run and hide from a few raindrops. It streams music wirelessly from any Bluetooth®-enabled device, so you can play all your favorite music. With its rechargeable battery, Garage Rocker won’t quit before the end of the shift! This is a real work companion, too—not just your day’s entertainment. The convenient magnetic tool holder is like a second pair of hands. With an integrated ruler, protractor, drill bit holder/identifier, socket tray and magnetized screw tray, Garage Rocker is an indispensable work partner as well as providing you with all-day music, sports and news. Specifications subject to change without notice. *Tools not included.